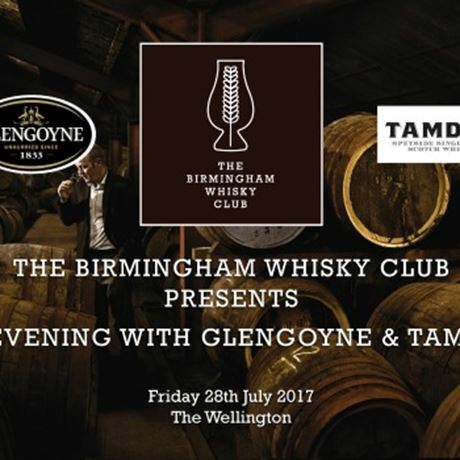 The Birmingham Whisky Club and Ian Macleod would like to invite you to to join them at The Wellington on Friday, 28 July for 'an evening with Glengoyne and Tamdhu'. Learn about these delicious whiskies, the history of the brands and taste through a selection of their delectable drams. Glengoyne's founders established tradition through necessity: there is no peat in the soil around Dumgoyne. This means there is no smokiness in Glengoyne whisky – and nowhere for coarse flavours or average casks to hide. That is why th distillery takes such care to craft its spirit, coaxing it through the slowest stills in Scotland, before maturing the whisky in fine Sherry cask, creating flavours of bold fruits and rich sweetness. Tamdhu's quality is defined by the exclusive use of only the finest Sherry oak casks, the hint of peat in its malted barley and the distillery's location on the banks of the River Spey; its water is drawn directly from the Tamdhu spring. Learn more about these whisky icons with their brand ambassador, and taste through a delicious selection of six drams. With this fantastic line-up, we can guarantee you're going to fall in love. Tickets are just £25 (£20 for members of The Birmingham Whisky Club) to taste through these delicious whiskies. 7pm - Tasting begins. You will be led through a selection of different drams by the experts at Ian Macleod and have the chance to ask all of your burning questions throughout.